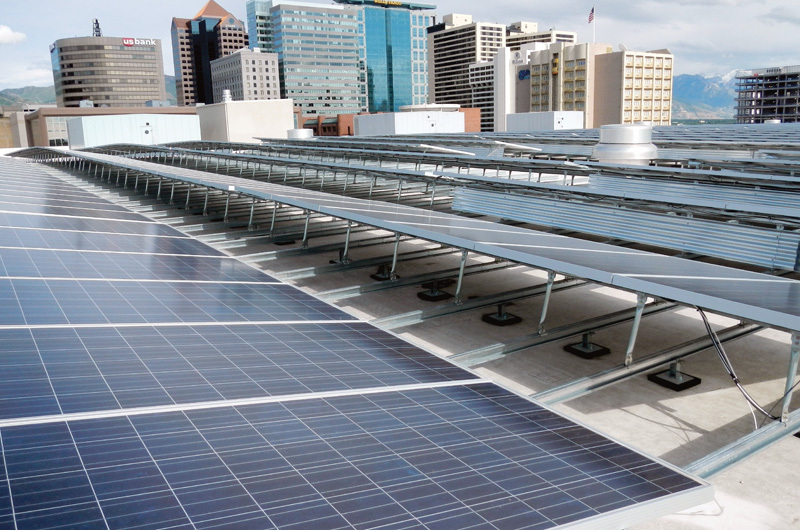 Utah's largest solar power project, on the roof of the Salt Palace Convention Center, involved a whole lot of people and hard work to get the financing, but it's now generating a lot of power—and pride. To borrow a phrase, sometimes it takes a village to build a solar power project. That certainly seems to be the case with the 1.65 MW solar project on the roof of the Calvin L. Rampton Salt Palace Convention Center in Salt Lake City, Utah. Not only is it the largest solar project in Utah, it took a whole lot of folks and organizations to get it built. "This was a monumental achievement by all parties involved," said Jim Welch, CEO of Bella Energy, which was the Engineering, Procurement and Construction (EPC) contractor on the Salt Palace Convention Center project. Welch termed the project "a wonderful accomplishment resulting from the hard work of countless people." Andy Blakeslee, Bella Energy's project manager, recalls taking a group of people from nonprofit organizations (who had supported legislative changes to help get the project built) up to the roof of the convention center to see the finished solar project. "One person almost broke down in tears when she saw the solar panels. She had been working on it for something like six years," he says. Essentially, a lot of people power went into the project that produces a lot of solar power. 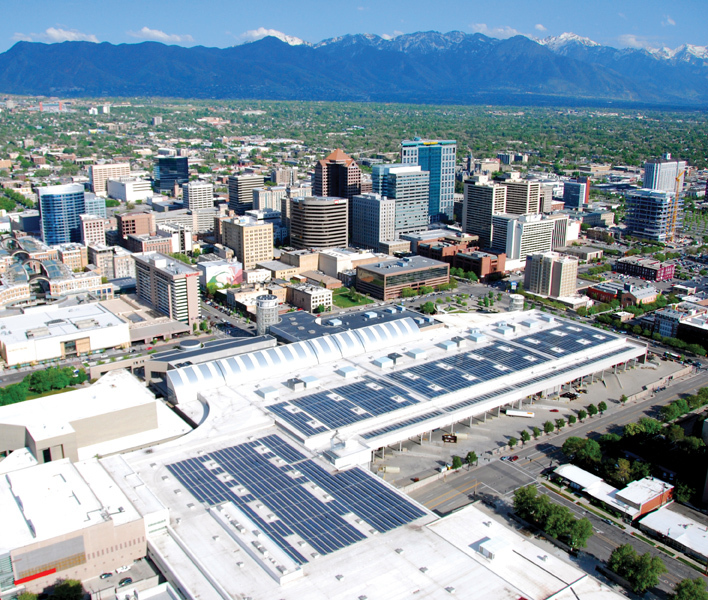 The 6,006 Suntech solar modules on the roof of the Salt Palace Center are expected to produce an estimated 2.3 million kilowatt hours of electricity in the first year of operation, covering approximately 17 percent of the Salt Palace's annual electrical use. It is the largest solar project on Rocky Mountain Power's entire electrical grid. And at 3.85 acres, it has a lot of roof to cover. The convention center boasts 515,000 square feet of exhibit space, 66 meeting rooms, and 164,000 square feet of meeting space including a 45,000-square-foot grand ballroom. The Salt Palace served as the Olympic Media Center during the 2002 Winter Olympics. The project goes a long way toward accomplishing County Mayor Peter Corroon's goal of installing 10 MW of solar power on Salt Lake County-owned facilities. Nine county facilities currently use solar power to help meet their electrical needs, but the Salt Palace project alone, which is the size of five football fields, nearly doubles the solar power generated in Utah. Solar power could help the city deal with sometimes severe air quality issues. During the winter, Salt Lake City has temperature inversions that trap smog and cause health problems. While some of this smog is emitted from cars, it is also generated by coal powered plants in the region. Any move toward emission-free power generation is seen as positive by area residents. Salt Lake County partnered with Bella Energy to build the system and CarbonFree Technology to own, operate, and maintain the system, providing power to the county at a fixed rate. Palace project benefits from the use of New Markets Tax Credits (NMTC), Qualified Energy Conservation Bonds, federal Section 1603 cash grants, and other federal grants. Financial partners included JP Morgan Chase and National Development Council, with Zions Bank Public Finance acting as a financial consultant. "This project is one of a very small number of solar projects ever to use NMTCs," said David Oxtoby, CEO of CarbonFree Technology. "As a result, the Salt Palace is able to buy the energy generated by the system at a low price competitive with grid electricity. 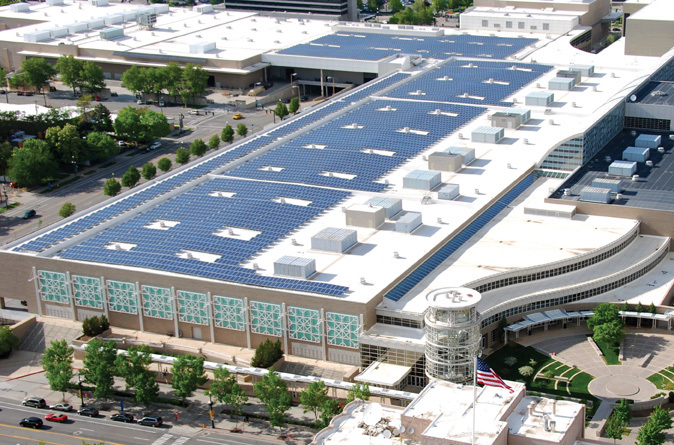 With the completion of the solar power project, the Salt Palace Convention Center is a local showcase for renewable energy and is marketing itself as one of the more sustainable convention centers in the U.S.
"While the transaction was more complex than the standard solar financing," Oxtoby added, "all parties were committed to making the project a success." "Financing the Salt Palace project required a lot of sweat equity and 14 months of hard work to develop a funding package that would satisfy the needs of each party," said Andrew McKenna, executive vice-president of Bella Energy. "I'm thrilled to finally see all that hard work capturing the power of the sun." Andy Blakeslee, Bella Energy's project superintendent, found working on the project fulfilling. "There were so many people involved who made it happen—it's been the most rewarding project I've worked on," he said. It's also the largest project that Bella Energy has taken on. "It's been a major project for us," says Blakeslee. Bella Energy started life in 1982 as Remote Power Inc, one of Colorado's and the nation's very first companies to sell and install solar electric systems. Founded by Jim Welch, the company focused on residential solar, before moving into commercial solar. These days, the company specializes in commercial projects, from 100 kilowatts up to 2 MW. "We've done a variety of properties and systems," says Blakeslee. "We've done roof mounts and ground mounts on schools, military bases, commercial, and municipal buildings." The Salt Palace—Bella Energy's first convention center project—was unique in a few respects, says Blakeslee. "It was different, both in scope and the client. It's a big roof and in installing the solar panels, we couldn't impede the convention center's operations. In fact, they had their biggest show come in while the project was under construction, which created some complexity in the project." While planning is key to the successful construction of any solar installation, this was even more true with the Salt Palace project. "We were able to leverage our past experience and do a good job of planning the construction, so it actually went pretty smoothly," says Blakeslee. "We had a good sense of what needed to happen in loading materials to the roof—we spent a month-and-a-half just getting materials up there. "We were familiar with putting solar power systems on big flat roofs, so the planning was pretty similar to what we were used to—it just took longer and involved more manpower," he added. The trade shows and events held at the Salt Palace can involve delivery of massive amounts of materials. Bella Energy and its subcontractors worked closely with the Salt Palace staff and arranged their material deliveries around the schedule of a number of events. They were able to utilize a strip of land alongside the convention center's loading dock, and often the loading dock itself, depending on what was happening with shows and events. "There were days when they would have shows going on and there were limitations on where and when we could load from. The loading dock could get busy." 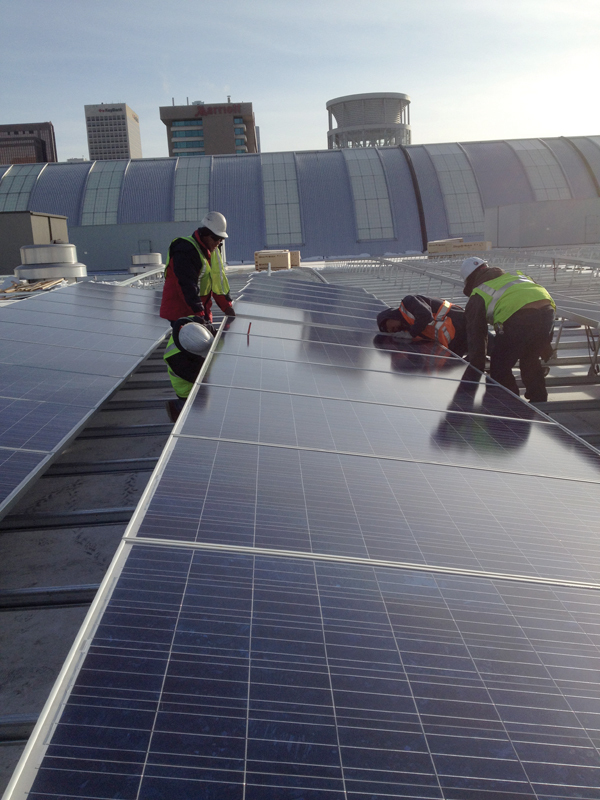 The 6,006 Suntech solar modules on the roof of the Salt Palace Convention Center are expected to produce an estimated 2.3 million kilowatt hours of electricity in the first year of operation, covering approximately 17 percent of the Salt Palace's annual electrical use. Having trucks with large loads come and go is pretty second nature to the convention center. "It really wasn't an issue. The facility is set up for handling lots of trucks, with a nice loading dock and plenty of space for our trucks and the crane." The biggest challenge, Blakeslee says, was that materials could not be staged on the ground. "Every time a truck came in, all that material would have to go on the roof by the end of the day." They did three trucks a day, staggering them. That represents one heck of a lot of materials. "We're talking about a lot of solar panels, racking, and materials," says Blakeslee. There were 18 53-foot long semi-trucks of solar panels alone. "It was getting a lot of panels up on the roof, and then once they were up there, it was getting the panels to where they needed to be on the roof and also out of our way, so we could construct the racking." The materials were lifted by crane to the 50-foot-high roof. From there, they were transported to where they would be installed on the large roof. That's where Utah-based subcontractor Clark's Quality Roofing got resourceful. Clark's craned an ATV and a trailer equipped with an electric winch to the top of the roof. Pallets of panels were transported wherever needed on the roof with the system. The trailer transported one pallet at a time; forks were inserted under the pallet so it could be lifted on and off the trailer with the electric winch. "They also adjusted the number of pneumatic tires on the cart according to the loads that were being moved," says Blakeslee. "We had to ensure that we weren't exceeding the load capacity of the roof. We had structural engineers providing us with a materials staging plan, so we didn't exceed the roof's load limits in moving and staging materials." Clark's Quality Roofing had installed a new Carlisle Thermoplastic polyolefin (TPO) roof on the Salt Palace the year before, so they were also up to speed on the specs of the roof, which had several levels, due to the different heights of the halls in the convention center. "Loading the different levels posed a challenge, but it also nicely broke the project into sections," explained Blakeslee. The roof is also broken up by parapet walls with expansion joints. To install the racking, solar panels, and associated electrical, Bella Energy and subcontractors Clark's Quality Roofing and Rydalch Electric approached the project in sections. "We did it more area by area, rather than in phases—it was more of a natural progression." Nine Salt Lake County facilities currently use solar power to help meet their electrical needs, but the Salt Palace project alone—which is the size of five football fields—nearly doubles the amount of solar power generated in Utah. As the EPC contractor on the project, Bella Energy selected the materials. "We chose a top tier type panel that we knew would perform for a long period of time." They opted for Suntech 275W panels that are manufactured in Arizona and are Buy American Act-compliant. All of the major components had to be made in the U.S. because of the tax credits involved in the financing. Blakeslee noted that they had used Suntech panels on previous projects and were happy with their performance. Unirac supplied its ISYS racking for the project. Blakeslee said that this was the first time they had used the ISYS racking, so there was a bit of a learning curve. "There were engineering tolerances that we needed to follow, so we did a mockup in one section of the roof to make sure we were putting it in correctly, before we let Clark's go at it with all their resources." The ISYS system is self ballasted. There were roof penetrations, but Blakeslee explained that these were for seismic engineering purposes. "We've used a lot of ballasted systems before, but they usually involved putting down concrete blocks to weigh the systems down. This was the first time we used a self-ballasted system that did not require additional ballast, which was really nice. The racking itself is secured to the roof with its own weight." He noted an important component of the system is a wind dam on the back of the racking, which creates a downward force on the racking. Salt Lake City gets some pretty good wind, so the wind speed design criteria for Salt Lake County and the Salt Palace was 90 MPH. Two Solectria SGI 500 kW inverters and a Solectria SGI 300 kW inverter were used on the project. There are two separate points of interconnection with the grid. One of the 500 kW inverters feeds a utility-owned vault on the southern end of the building and the other 500 kW and 300 kW inverters feed a separate vault on the north end. In terms of a timeline, construction started in mid-December and was finished the first week of May. They were fortunate enough to have good weather almost all the way through. "We got really lucky, it was one of the driest years on record," said Blakeslee. "The weather was a variable that we were worried about going into the project, so it was a pleasant surprise. We had a few days of snow, but we worked through those days, doing some snow removal on the roof to keep the project moving." The project was finished on schedule, despite a bit of a slower start, with the racking mockup. "It was a bit slower at the beginning, because we were figuring out the new racking, but once we determined the quality was there and the process was good, Clark's put more guys into it and they just worked their way steadily through it." Blakeslee said planning was clearly one of the keys to the success of the project, and of course it was important to have the right components to build the project. But it also came down to the people. "I'd say that the collaboration of all the parties and partners involved was also what made it successful. When we had the ribbon cutting ceremony, there were 40 people in the room who were involved in the project—and they all had an important role in making it happen." The project had its share of stop-and-goes, before construction finally moved ahead, in late 2011. Blakeslee said one of the partners likened the project's supporters to Roomba vacuum cleaners, due to the hurdles they had to overcome. "When they hit a wall, they could have quit, but they just carried on and went in a different direction." With the completion of the project, in addition to being a local showcase for renewable energy, the convention center is now marketing itself as one of the more sustainable convention centers in the U.S.